For your most recent project, Eclipse, you’ve painted sixty plant silhouettes on gesso panels. 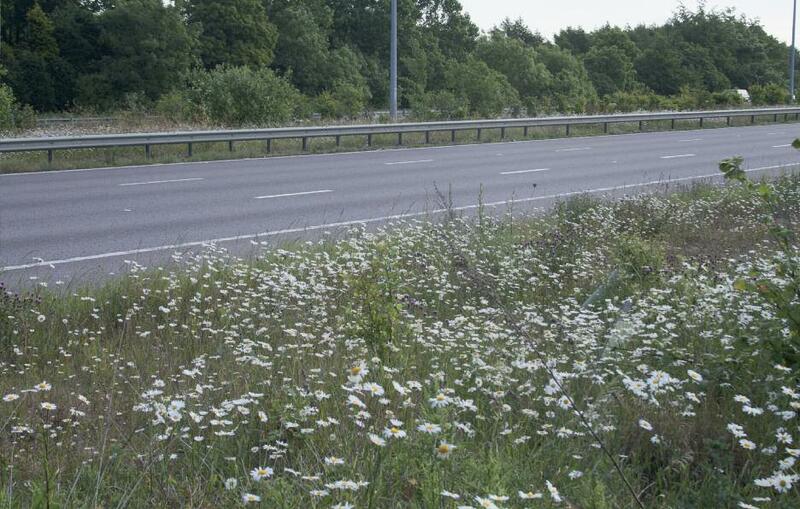 These are common woodland plants that are also found in less conventional landscape spaces, such as motorway verges. Collisions between the natural world and car travel are an underlying theme in your work. Could you expand on the thinking behind the strange juxtaposition of taxonomic systems that inhabit this work? People go to the woods as strangers from their everyday life in the city or in the town; we go to experience natural habitats, back to nature – somehow this idea of being natural seems more authentic – and the car park is a threshold at this point of change, where people either sit in the car with a Thermos or get out and take their dogs for a walk. We go to places like King’s Wood to experience ‘nature’, but the woodland is artificial. It’s managed, it’s controlled. Some of it is coppice – it’s ancient but nonetheless forms an industrial site. Much of the rest is in large part a plantation. Some visitors come to King’s Wood to have this kind of communion with nature. Are you suggesting that this leisure tourism is a folly? We travel and engage with landscape largely as tourists. Today relatively few people work in the landscape – it’s no longer an agricultural economy as it was two hundred years ago – so our experiences are largely premised on tourism. ‘Oh! Let’s go and have a look at that because it will do us good!’ It somehow edifies. But there are other considerations –in travelling to places like the woods we leave a carbon footprint, we leave mess, we leave litter, we leave fumes – all these things have a massive impact. Everything we do has an impact. But travel somewhat perversely helps us appreciate the landscape around us. This tradition of tourism goes back over two hundred years and has roots in the Grand and later English Tours encouraged by writers like William Gilpin and Arthur Young which had an immense impact on how landscape was visualised, especially through painting. Could you say more about the landscape experiences car travel opens up and this term “edgelands” which crops up in your writing? Eclipse comes out of a larger investigation of landscape and the eighteenth century Picturesque called Soft Estate. What interests me here are the connections between contemporary landscape experiences, often mediated through driving, and the experience of the landscaped country park. In both cases, the park and motorway edge form a manufactured view that is experienced as a kind of separation, where space is often telescoped and organised compartmentally and either seen moving, or in country parks from artificial vantage points. Engineered neatness is often bounded by roughness and scrub providing contrast and giving what proponents of the eighteenth century Picturesque would call ‘variety’. Rough unkempt ‘edgelands’ act as a foil. They are visually and ecologically rich, contrasting with the architecture of control and suggesting, to my mind, a kind of subversion. “Edgelands” as you use that term, are they a psychological state as well as a geographic location? They’re both. Edgelands are things we touch but don’t necessarily feel. They are places we pass through but don’t necessarily engage with. They are to do with ‘transit’ spaces; waiting rooms, an airport lounge, a supermarket car park, but also leftover pockets and ribbons of natural habitat. In our rat race society, rushing around on roads, edgelands are produced by our not having time to engage, so we rush through, we rush by. What is left by the side is an edgeland, not forgotten but not quite remembered either. They can be simultaneously ecological, political or poetic spaces. I’m particularly interested in their visual richness. In relation to the broader project (Soft Estate) within which Eclipse sits, could you say more about those particular landscape sites which we pass through quickly, and don’t linger in? These sites run the length and breadth of our road networks. They are full of native species including quite a few rare ones. There is an affinity between woodland and verge as both are man-made, sculpted. Both share common flora from buttercups to wild herbs. Thistles and teasels will just as easily appear in the central reservation as in the wood. I’ve always had this sneaking feeling that driving down the motorway is like driving through a country park, only you are doing it at high speed. In fact driving – period – is often like driving through a country park estate with these sudden reveals, ravines, bridges, tunnels – things change but really rapidly. That’s where my interest lies, in this artificial ‘parkified’ landscape. The term landscape comes from the Dutch word ‘landschap’ which meant artificially managed land. This artificiality became enshrined in eighteenth-century English landscape painting. Like a continuous experience of ‘framed’ shots – driving down the motorway – there’s a ‘frame’ here there’s a ‘reveal’ there. However instantaneous, it builds a picture. It’s a picture and then another – fugitive instant stills, no sooner there than they’ve gone. Your work seems to slow that moment down and acknowledge that the veneer of banality is merely that. Within those same spaces it’s not just a Blakean world of joy and complexity but a strange and contested environment. There is a world of complexity there. It’s there all the time. We don’t see it because we’re moving. Driving a car you’re in a kind of bubble. It’s only when you stop on the motorway that you see these inviolate and inaccessible spaces. The contrast of stillness makes them even more appealing. They are also important corridors for species survival. It’s a buffer zone, a space between spaces, a space beyond the space we can access. There’s a political dimension to these spaces. They are emblematic of control, they are structured, almost like a landscape painting might be, but at the same time they are overridden with weeds which are chaotic. These plants are great survivors and following no rule. They are the complete correlative of control. People talk about ‘raw nature’ and you’ve used the term ‘radical nature’ – it’s a tautology, because nature itself is radical. It’s designed to survive. Weeds are often a metaphor for threat. They nearly always signify nature as invasive. They are usually something you want to get rid of because they are unproductive. But of course weeds aren’t a specific genus, they might only be weeds within the confines of a particular crop production, but in another context might be incredibly rarefied and beautiful things to have. This interview was conducted by Dan Howard-Birt. Edward Chell‘s Soft Estate exhibition is currently showing at the Spacex Gallery in Exeter, UK. Excellent post! I empathize with what was written here.